All those Ice Age volcanoes and storms left us some very interesting fossils. Florida is full of extinct mammal bones while the Arctic has millions of mammoths and other frozen animals. Homo erectus [same, upright]: these are fossils that would be called human if they weren’t turned to stone. Their bodies and size were human, but their skulls had slightly odd shapes. The big reason evolutionists think they aren’t quite human is because their brain space was smaller than most of ours. Try asking your mom if people are smarter the bigger their brain is. Neanderthals [knee-and-er-tallz, from Neander’s Valley]: these are the “cave men” you’veprobably heard about and seen. 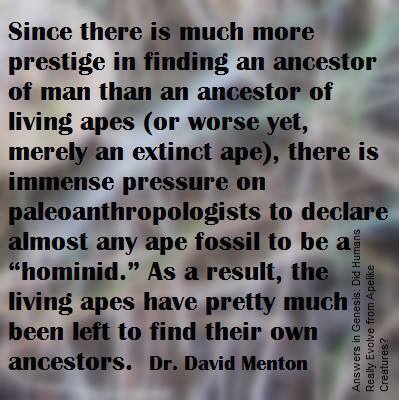 Even evolutionists are realizing they are just different varieties of human beings, not stupid ape-men. Oh, yes, their brains are bigger than most of ours. Both these groups would be hard to spot even if a paleontologist were to meet one on the street. People come in all shapes and sizes; today we know all of us are smart and well designed no matter what size our brains are or how wide our foreheads are. And what about “Lucy” and the rest of the “ape-men” you see at museums? The ones with names like Australopithecus? The only thing making them look close to humans is the imagination of the artists. We aren’t surprised to find there were lots more varieties of people and animals in the past than we see today. Extinction has been with us for a long time. Every day the earth loses some of the amazing creatures God designed 6,000 years ago. Lucy: Did She Walk Like Us? If you want to check out all the jumbled up ‘odd’ humans and “ape-like ancestor” types, the Smithsonian has a large section on the fossils with some interesting reconstructions. This entry was posted in Cool Animals, People, What Evolutionists Must Believe and tagged creation, Creator, Fossils, Human evolution.